mother's day is sunday may 12th. Check out the "SHOP" section for spice blends and brownie mix for that special MOM in your life! Spring is springing in Oklahoma… well at least for a couple of days this week. Eggs, I always think about eggs when recipe developing at the start of spring… and well, this year is no different. 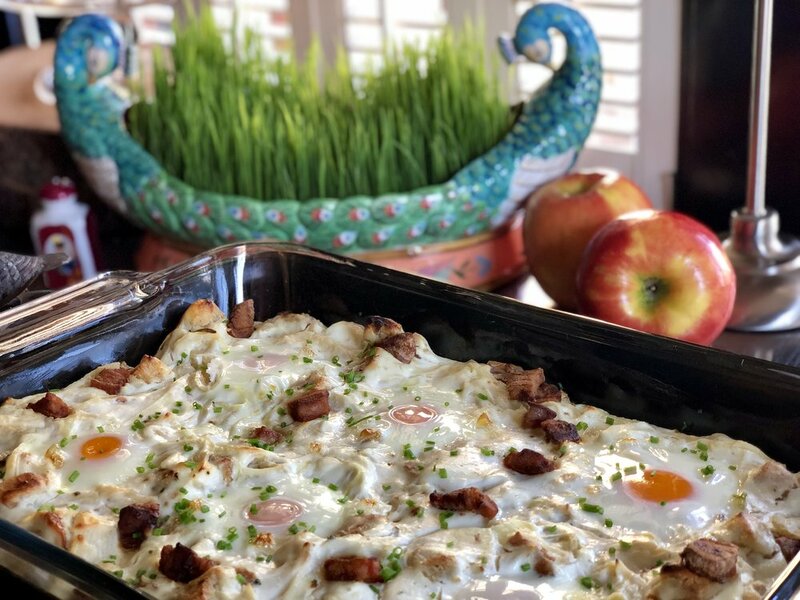 To celebrate spring “In The Kitchen,” I thought I would knock out something brunch inspired, and it ended up being a home run! Try it at your next brunch for any time of the year! Cheers! Baked Ricotta & Eggs With Lardon, Lemon, & Thyme serves 4-6. Preheat your oven to 450 degrees. Butter the bottom and side of a 9x13 glass or ceramic casserole dish. Set aside. In a cold large frying pan add the cubed (bite size) salt pork. You may also use chopped thick slab bacon, but not too “smoky” in flavor. Begin to heat slowly to render the salt pork and to cook your lardons crispy. Cook the lardon until golden and tender, then remove to a plate lined with paper towel to absorb the extra fat. Pour out (or save for another use) the rendered salt pork fat and wipe out your pan of any cooked brown bits. Add a tablespoon or two of good olive oil and begin heating. To the pan add the thinly sliced onions. Start sautéing gently. Season with “Cook’s Line Seasoning” or salt and pepper to taste, and the fresh thyme. Cook until the onions are lightly golden and tender. Spoon the onions into a large mixing bowl. In the same pan add another 3 tablespoons or so of olive oil. Heat the oil until shimmering then add the diced bread croutons. Fry the croutons in the pan until golden brown and crispy. Spoon the croutons into the same bowl as the onions. In a separate bowl add the ricotta cheese and milk. Season with a small pinch of “Cook’s Line Seasoning” or your own salt and pepper. Add the milk along with the lemon zest and mix to a creamy consistency. Pour the ricotta cheese mixture into the bowl of onions and croutons, and fold together until evenly mixed and blended. Spoon half of the mixture into the bottom of your buttered casserole dish, and spread out evenly. Sprinkle the top with half of your lardons. Add the last half of the ricotta mixture on top and spread out evenly, along with the remaining lardons. With the back of a dinner spoon, make six small wells into the layers. Carefully crack a whole egg into each well, mindful that the eggs do not run out and stay in each well. Place the dish into the oven and bake 15-20 minutes depending on your oven and how soft you would like the eggs. I checked mine after 20 minutes, and the yolks were not as runny as I would have liked but did the job. Remove from the oven and sprinkle the top with the minced fresh chive. Cut portions according to the egg and serve right away!